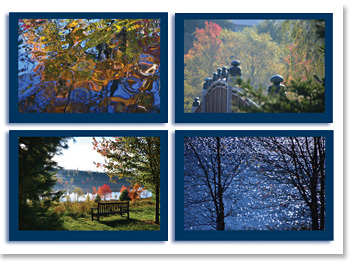 Enjoy and share the new Siddha Yoga Note Cards – Blue Water Collection. The exquisite images on these cards were photographed around the shorelines and hillsides of Lake Nityananda, on the sacred grounds of Shree Muktananda Ashram in celebration of Bhagavan Nityananda’s Golden Punyatithi. Send the Siddha Yoga note cards as thank you cards and holiday greetings. Share your insights and sadhana experiences. Give the collections as gifts to your friends and family. Keep them as inspiration for poetry or to practice contemplation. Siddha Yoga note cards are a perfect way to commemorate any milestone throughout the year!